31.08.2013: photo caption: BMW Motorrad GoldBet SBK Team Rider Chaz Davies #19 (GBR) riding the BMW S 1000 RR. photo caption: BMW Motorrad GoldBet SBK Team Rider Chaz Davies #19 (GBR) riding the BMW S 1000 RR. Nürburgring – Free Practice & Qualifying Practice 1. Weather conditions: Partly sunny, partly cloudy. The BMW Motorrad GoldBet SBK Team took provisional pole-position at its home round at Nürburgring (GER). Factory rider Chaz Davies (GBR) set the fastest time in today’s first qualifying practice for the tenth round of the 2013 FIM Superbike World Championship. His team-mate Marco Melandri (ITA) finished tenth. In this morning’s free practice session Chaz and Marco were fourth and sixth respectively with their BMW S 1000 RRs. In the FIM Superstock 1000 Cup, Sylvain Barrier (FRA) from the BMW Motorrad GoldBet STK Team also took provisional pole-position after being fastest in today’s first qualifying session with his BMW HP4. His team-mate Greg Gildenhuys (RSA), who has never raced at Nürburgring before, finished 11th. “It was a good day. I am happy with the RR, it was working pretty well straight away this morning. The bike was already pretty good in the dry at Silverstone and it was also working very well in Russia so that shows that we have found some decent settings in the last few races. “It was quite a good day. The bike works well here despite the fact that the track is bumpy. With the hard tyres, we were fast, but with the soft tyres I was not able to ride well. I could not raise the tyre temperature properly and with the little grip I could not go faster. “We are quite happy with today. Chaz has shown he’s in really good shape, he set the fastest lap and demonstrated that he feels really comfortable on this track, where last year he was very successful. We’re really happy with this result which also repays the work the team has done. 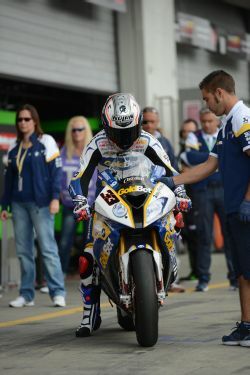 Marco’s results do not show the real situation, with hard tyres he was fast and the race pace was really good. Tomorrow we need to find a solution to improve with soft tyres to put in a good performance in qualifying and to start from the front. Anyhow, Marco is focused and for sure, he’ll do very well. “Overall it was a positive day. It was nice to get back to action after the long break. Our riders spent the morning session taking off some rust but I must say that they started on the right foot. Both began with our base setting and then they worked as usual on the suspension set-up and they were able to evaluate almost all tyres available. Chaz did an amazing lap claiming P1. Now we have to work on the race pace because we have seen that our competitors are quite consistent. Marco was quite fast with the used tyre and did a lot of consistent lap times but once we fitted a new soft tyre, he could not get the best out of it.